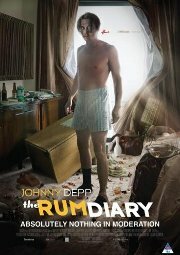 This semi-autobiographical, might-have-been tale is based on the first novel by Hunter S. Thompson. A hard-drinking journalist takes a job at a struggling newspaper in San Juan, Puerto Rico, after being fired twice in the USA. His erratic editor assigns him to tourist pieces and horoscopes, but promises more. He shares a run-down flat with another aging and equally alcoholic reporter. A wealthy property developer hires him to write advertorials disguised as news to hook some investors into buying an island near the capital to build a resort. The developer's girl-friend gives him the come-on. Things start to get really complicated when he and his flat mate get into trouble with locals, the developer blows his cool, and the newspaper hits serious financial trouble. So how do you like my trophy wife?